Mahabharata today has 100,000 slokas and is believed to be written by Sage Veda Vyasa, but in reality it was narrated by him and written by Lord Ganesha. 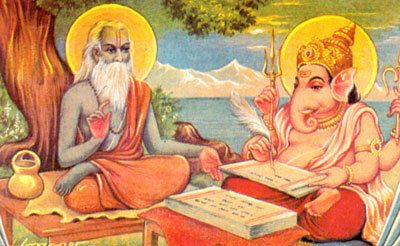 When first narrated, it had only 8,800 slokas and Mahabharata original name was ‘Jaya‘ (Jayam) as written by Ganesha. This made it expand to 24,000 slokas and was named ‘Vijaya (Vijayam)‘ and then renamed it as ‘Bharata‘. In next generation, Ugrasravas, belonged to the Suta caste, who were typically the bards of Puranic literature, narrated this story to sage Saunaka and other sages in Naimisa forest. Ugrasravas (also named as Suta muni or Suta Goswami) was the son of sage Lomaharshana and belong to disciple chain to Vyasa. The full 100,000 verses of the Mahabharata was completed several centuries later by addition of many stories and was finally named as ‘Mahabharata‘. Bhagavad Gita is one such addition into Mahabharata, which was done during later generations and written according to the conditions of the society that prevailed during those times. It is placed in Mahabharata’s Bhishma Parva with 700 slokas divided between 18 chapters. In the epic Mahabharata, Sanjaya, counsellor of the Kuru king Dhritarashtra, after returning from the battlefield to announce the death of Bhisma begins recounting the details of the Mahabharata war. Bhagavad Gita forms the content of this recollection. Why would Krishna liesurely narrate 700 slokas in 18 chapters to Arjuna, when war was just about to begin. It would take him entire day to recite that much of concept and also showing his Viswaroopam (Infinitude) in the end. Would Kaurava army wait for all these preachings to be completed and then start the war ? What would both armies be doing when these two were immersed in their own discussions ? Similarly, Vishnu Sahasranamam is narrated through Bhishma’s character before his death. This Vishnu sahasranama is found in the Santi Parva of the Mahabharata is the most popular version of the 1,000 names of Vishnu. Another version exists in the Padma Purana and Matsya Purana. Each name eulogizes one of His countless great attributes. Unlike the Vedas, which have to be preserved letter-perfect, the epic was a popular work whose reciters would inevitably conform to changes in language and style. So, many additions were made to it by writers of that generation. The narration (Bharata) of the history of Bharata kings by sage Vaisampayana to Kuru king Janamejaya was embedded within this narration of Ugrasrava Sauti. Vaisampayana’s narration (Jaya) in turn contains the narration of Kurukshetra War by Sanjaya, to Kuru king Dhritarashtra. Thus Mahābhārata has as a Story within a story structure.